Thanks to everyone who entered this week's giveaway! 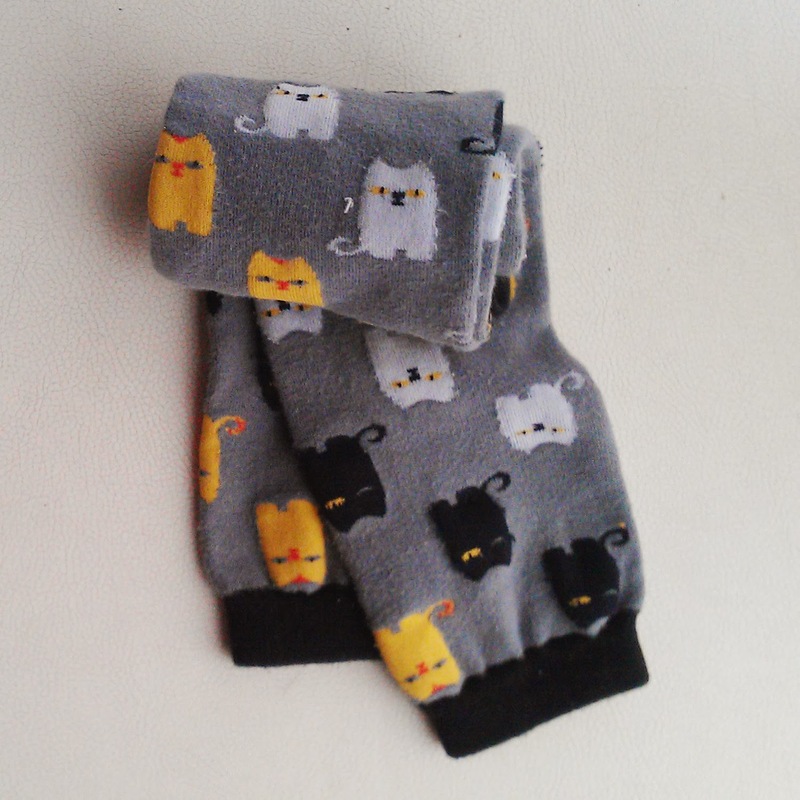 A lot of you were pretty excited about these kittycat socks. The winner was anamirandasf, who entered via Instagram. Ana, please email me at bonmarchecouture at gmail dot com with your mailing address, I will get these cute socks right out to you! I've spent the last week or so tinkering with a custom header for the blog — I really did not like all the dead space that I had before, and I wanted to add some pages to the blog as well. I'm not 100 percent happy with it, so I'll probably keep playing with it, and your feedback is definitely welcome! So I forgot to mention yesterday that I did, in fact, fulfill my fashion challenge for the week by wearing my royal blue sweater/sweatshirt/thinger, but I realize I kind of do not get any points for it because I didn't get a single photo of myself wearing it! But you can take my word for it, right? For this week's challenge, I picked out two pieces that caught my eye as I was hanging things up in my closet, plus a pair of pants that have just been bedeviling me for a long time. One thing I've noticed from doing daily outfit posts is that I don't have many pants that I really like. Pregnancy seems to have altered my hip-to-waist ratio, so the fit is just off on pretty much everything I own. It's time to either invest in some new pairs of pants, or take the ones I have to the tailor. These gray slacks are a great example. In theory they should fit, but I end up having to wear a belt with them, which is awkward and makes me feel bulky. I'm giving these one more shot and then it's off to the consignment store or the tailor's. This vintage tulip-print dress has been languishing for no good reason. It was one of those pieces I had a brief but passionate love affair with, and then just let it sit on the hanger for, like, a year. Time to give it another spin. There is nothing in the world wrong with this blouse, which I bought for $1 last year at a consignment bag sale. (I tend to kind of go nuts at bag sales ... ) But I just never reach for it, and when I do wear it, I tend to feel a bit boring/conventional. Time to see if I can jazz it up to my satisfaction.